Casemate Publishers and Book Distributors, 9781612001524, 384pp. "Gentlemen, do not be daunted if chaos reigns; it undoubtedly will." So said Brigadier S. James Hill, commanding officer of the British 3rd Parachute Brigade, in an address to his troops shortly before the launching of Operation Overlord--the D-Day invasion of Normandy. No more prophetic words were ever spoken, for chaos indeed reigned on that day, and many more that followed. 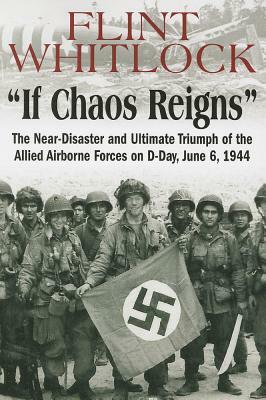 Much has been written about the Allied invasion of France, but award-winning military historian Flint Whitlock has put together a unique package--the first history of the assault that concentrates exclusively on the activities of the American, British, and Canadian airborne forces that descended upon Normandy in the dark, pre-dawn hours of 6 June 1944. Landing into the midst of the unknown, the airborne troops found themselves fighting for their lives on every side in the very jaws of the German defenses, while striving to seize their own key objectives in advance of their seaborne comrades to come. Whitlock details the formation, recruitment, training, and deployment of the Allies' parachute and glider troops. First-person accounts by the veterans who were there--from paratroopers to glidermen to the pilots who flew them into the battle, as well as the commanders (Eisenhower, Taylor, Ridgway, Gavin, and more)--make for compelling, "you-are-there" reading. If Chaos Reigns is a fitting tribute to the men who rode the wind into battle and managed to pull victory out of confusion, chaos, and almost certain defeat. Author/military historian Flint Whitlock graduated from the Army's Airborne School at Ft. Benning, GA, in 1965 and spent five years on active duty, including a combat tour in Vietnam. He is the author of nine books, six of which are about World War II, and is currently the editor of WWII Quarterly. He has appeared in documentaries on The History Channel and on the Fox Channel's "War Stories with Oliver North," and now lives in Denver, CO.